UPDATE 1/30/2013: I did get a little confused on the transfer ratios. 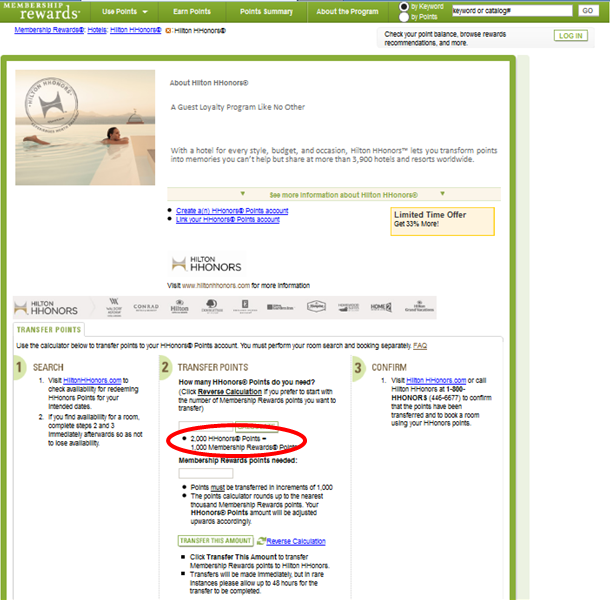 Usually, the transfer ratio is 1,000 Membership Rewards points to 1,500 Hilton HHonors points. So while American Express is indeed offering 2,000 Hilton HHonors points for every 1,000 Membership Rewards points transferred through January 31, this is still worth it going forward. While considering hotel options for an upcoming trip, I was considering using Hilton HHonors points before my Gold status from last year expires. Yet, I don’t have a lot of points so was considering transferring points from American Express. That’s when I accidentally discovered a loophole for accumulating double the Hilton HHonors points. Ordinarily, American Express points transfer at a 1:2 ratio in increments of 1,000 points. So if you transfer 2,000 American Express you will end up with a measley 1,000 American Express points. The key is to going from an awful exchange to an absolutely incredible exchange starts with Virgin Atlantic. 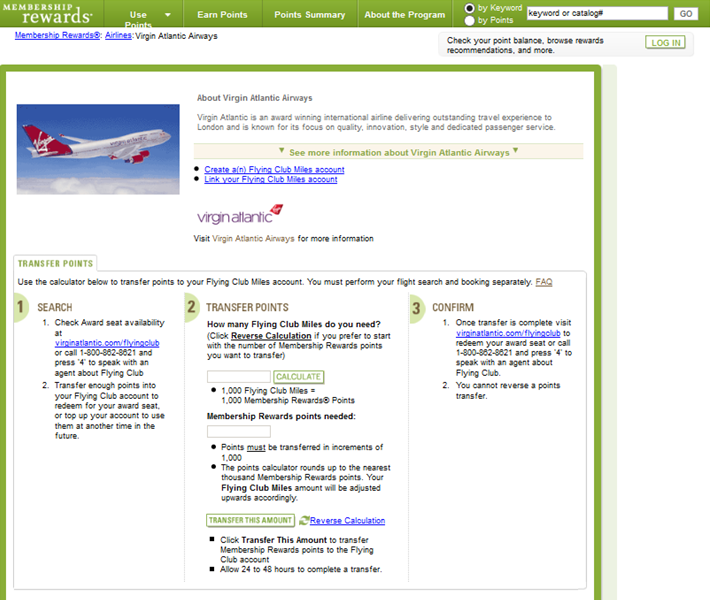 Membership Rewards points transfer at a 1:1 ratio to Virgin Atlantic Flying Club miles. Per Hilton HHonors points transfer page, miles transfer at 2:1 ratio. 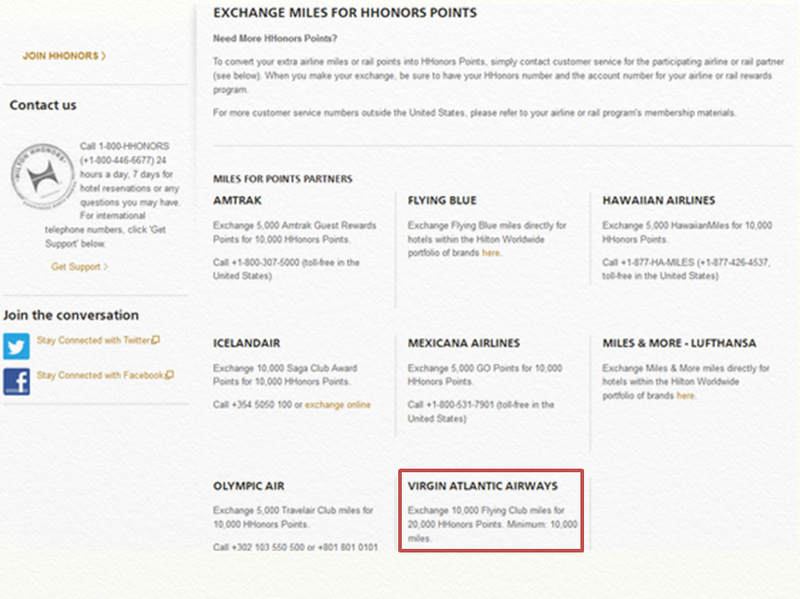 Or 20,000 miles for every 10,000 Hilton HHonors points—a spectacular value! To put that in perspective, if you transferred the 75,000 American Express points you may have earned from the recent American Gold Business card you would be able to turn them into 150,000 Hilton HHonors points. Enough for up to 3 free nights in a Waldorf Astoria or Category 7 (the highest award category). I’m confused. Doesn’t the first screen shot show that you get 2,000 HHonors points for every 1,000 Membership Rewards points? I don’t see what you’re gaining by funneling the points through Virgin. Good catch, and thanks for the question. 2,000 HHonors points for 1,000 Membership Rewards points is only good through the end of January. While I was mistaken about it being 1:2, it still would be a better deal moving forward than 1:1.5.